From a pure antitrust perspective, the real story behind the DOJ’s Apple e-book investigation is the Division’s deep commitment to the view that Most-Favored-Nation (MFN) clauses are anticompetitive (see also here), no doubt spurred on at least in part by Chief Economist Fiona Scott-Morton’s interesting work on the topic. To build its early lead in e-books, Amazon Inc. AMZN +0.19% sold many new best sellers at $9.99 to encourage consumers to buy its Kindle electronic readers. But publishers deeply disliked the strategy, fearing consumers would grow accustomed to inexpensive e-books and limit publishers’ ability to sell pricier titles. Apple’s proposed solution was a move to what is described as an “agency model,” in which Apple takes a 30% share of the revenues and the publisher sets the price — readers may recognize that this essentially amounts to resale price maintenance — an oft-discussed topic at TOTM. The move to the agency-RPM model also entailed the introduction of an MFN clause stipulating that publishers could not sell to rivals at a lower price. Whether Apple facilitated a collusive agreement among publishers or whether this industry-wide move to the agency-model is an efficient and consumer-welfare enhancing method of solving the incentive conflict between publishers and retailers remains to be seen. What is somewhat new in this dispute about book distribution is the technology involved; but the underlying economics of vertical incentive conflict between publishers and retailers is not! 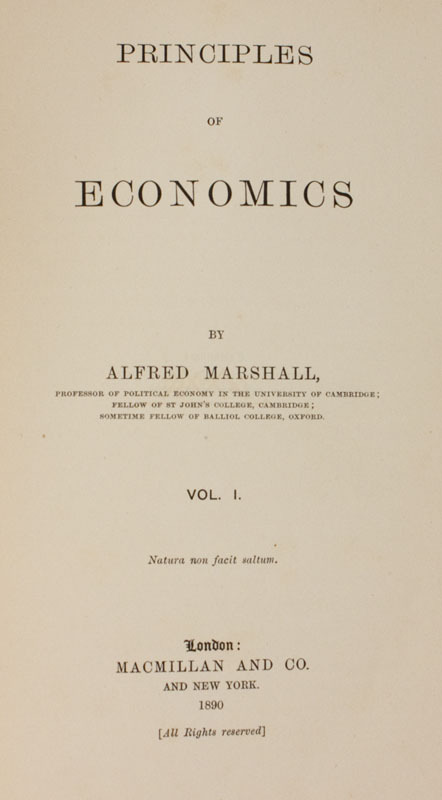 In 1890 Frederick Macmillan of the Macmillan Company was casting about for a book with which to conduct an experiment in resale price maintenance. For years it had been the practice in Great Britain for the bookselllers to give their customers discounts off the list prices; i.e. price cutting had become the general practice. In March, 1890, Mr. Macmilan had written to The Bookseller suggesting a change from the current discount system and had inserted a form to be filled out by the dealers. Experimentation with business models to align the incentives of publishers and sellers is nothing new; it is only wonderful coincidence that the examples involve a seminal economics text published as the Sherman Act was enacted. Nonetheless, an interesting historical parallel and one that suggests caution in interpreting the relevant facts without understanding the pervasive nature of incentive conflicts within this particular product line between publishers and sellers. One does not want to discourage experimentation with business models aimed at solving those incentive conflicts. What remains to be seen is whether and why the move to the new arrangement was executed through express coordination rather than unilateral action. Marshall’s Principles may have been the first case of RPM in books, but among grocers the practice apparently dated to the 1860s or so, at least in England and probably in the USA. See B.S. Yamey, The Origins of Resale Price Maintenance: A Study of Three Branches of Retail Trade, 62 Econ. J. 522 (1952). There it was probably used to facilitate retailer collusion, as it was in the Dr. Miles case itself. Incidentally, the first RPM case to reach the Supreme Court did involve books and it preceded Dr. Miles by three years. That was Bobbs-Merrill v. Straus, 210 US 339 (1908), which held that the first sale (exhaustion) doctrine precluded enforcement of a copyright resale price maintenance restriction. Bobbs-Merrill the publisher sold a copy of a pulp fiction novel subject to a restraint that it not be sold for less than $1 per copy. Macy’s department store violated the restriction by selling the book for 89 cents. The Court did not mention the antitrust laws.